Shields Insurance, a full-service insurance and financial services provider operating in Mount Vernon, IL, has debuted the latest community cause campaign in a recently launched community enrichment program called ‘Agents of Change’. For the next two months, they will be supporting Jefferson County Toys for Kids, a regional nonprofit organization which creates joy and hope for hundreds of struggling local families every year by gifting toys at the holidays. At our agency, we want to bring joy to every child this holiday season...neighbors helping neighbors is what it’s all about, and coming together as a community to help children and families facing financial challenges is something which should inspire us all. Shields Insurance, a full-service insurance and financial planning provider serving families and businesses from offices in Mount Vernon, IL, brings happiness and hope to local children this Christmas with the debut of their latest Community Cause campaign. 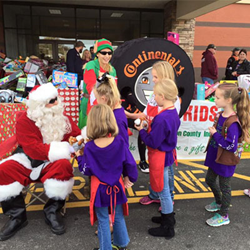 The new beneficiary, Jefferson County Toys for Kids, is a regional nonprofit organization which enhances the lives of struggling families whose children might not otherwise find gifts under the tree. Donations to support this worthy initiative may now be made at https://www.crowdrise.com/o/en/team/providing-hope-for-the-holidays. Simply stated, Jefferson County Toys for Kids creates joy for local children during the holidays. In operation for 25 years, last year Toys for Kids was able to provide toys for over 300 families. Their goal is to expand their reach each year, so that as many kids as possible are able to receive the feeling of hope and belonging that comes along with the gift of a new toy. The good news is that supporting a cheerful season for all the community’s children has never been easier. The agency itself has pledged to donate a whopping $20 to Toys for Kids for each and every referral they receive for an insurance quote for the duration of the campaign with no purchase necessary – meaning that all those who would like to join Shields Insurance’s fundraiser need not even reach into their own pockets to do so. To recommend family and friends for no-obligation quotations, simply visit http://shieldsinsgroup.com/causes/4036/. Meanwhile, the agency’s caring team is hard at work promoting Toys for Kids through a dynamic social media and email outreach campaign. They have also featured the cause in their print and electronic magazine, Our Hometown. Helping customers and friends to ‘live well and thrive’, the publication is delivered to thousands of households in Mount Vernon and surrounding communities every month. Current and past issues may be enjoyed at http://shieldsinsgroup.com/magazines/. Shields Insurance has demonstrated their desire to create positive change in the community by the recent establishment of a master charity program, which is part of the nationally celebrated ‘Agents of Change’ movement. “We are fully committed to helping local folks in need of a helping hand, and will be selecting a new group, family or individual to support every two to three months,” promised Shields. More information on the agency’s local Community Cause campaigns may be found at http://shieldsinsgroup.com/community/. Serving families and businesses from offices in Mount Vernon, IL, Shields Insurance is committed to bringing local people an agency which understands their needs. Paul Shields and his team of dedicated professionals have worked with carriers to assemble a variety of products and services to ensure clients’ peace of mind. From all of the insurance products a typical consumer needs (auto, home, business, boat, ATV, etc. ), to developing long-term financial planning strategies, Shields Insurance delivers consistently superior service. Their caring experts may be reached by calling 618-241-0551. For more information on the agency, please visit http://shieldsinsgroup.com/.